Last fall, I stumbled across a hobby that has completely taken my spare time by storm. I’m not even sure, now, what started it. I suddenly had this desire to bind a book. I’ve always had a love for books. I have many of them! 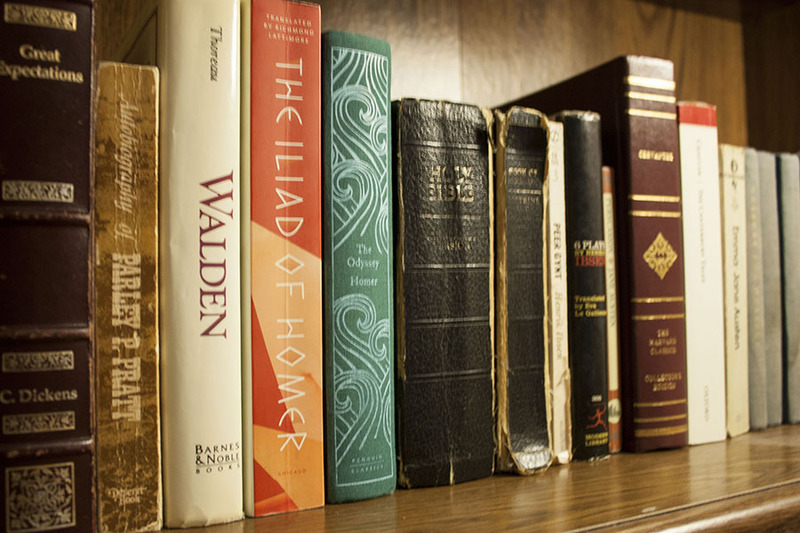 But I had always shied away from actually making them because all of the hand made books that I had seen are very crafty, not very durable and not really anything that I would pick up and page through or read. They mostly looked like scrap books and involved craft store papers and oftentimes yarn or tassels. But one day I came across this video. Kristin made it all look so approachable! I then ordered a DVD from the library and spent a good amount at Hollanders online store on book-making supplies before I felt ready to go. For me, though, I didn’t want to make a sketchbook or a diary and I certainly didn’t want to write my own book. I wanted to bind a classic book that I didn’t already own, or perhaps a book that I had in paperback, but didn’t have in hardcover yet. I quickly came to the perfect fit. 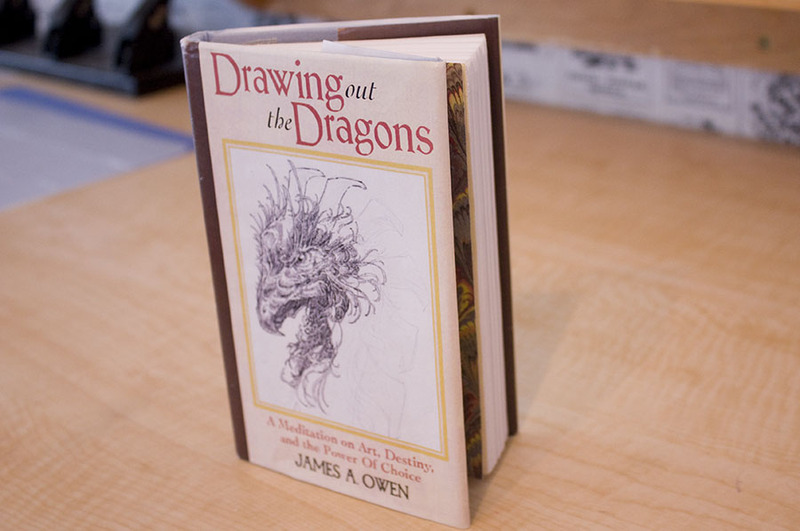 James A. Owen is a great author and a really inspiring guy. He recently produced an ebook that talks about his life, challenges, and how he overcame them. It is inexpensive and he often gives copies away for free. I loved reading it! But, at the time, it was only available as an ebook. (for those interested, it is now available as ebook, paperback and hardcover, along with lots of other extras at his website. Well worth the purchase!) If there is no hard copy offered, i thought, this might just be the perfect book for my first binding project! So, with the materials that I ordered and Larry Withers’ bookbinding DVD, I got to work. The result was… Well, a good first try! I imposed the ebook PDF that I had bought from James Owen’s website using the software Cheap Imposter for my Mac. Imposition is the process of taking a document in linear fashion (page 1, 2, 3, etc.) that you might read on your computer or print at home and moves the pages around so that after you print it on both sides of the paper, stack the sheets and fold them, they are still in the right order. Cheap Imposter did the trick, though I didn’t realize that the free version printed the pages at 70% of their original size. I printed the pages out in color on my home inkjet printer (double-sided) and set out organizing the pages and folding them. Once I got the pages done, the rest of the binding went pretty smoothly. Eventually, I wanted a dust jacket for the book, so I grabbed the pages with the cover from the PDF file and expanded them so they would work on the dust jacket. Now, this was my first binding project, and, although I was generally pleased, it was important to me to review what I did wrong in preparation for my next project. So, what did I do wrong? 1. I printed on 22 pound, bright white, 8.5 x 11 paper paying no attention to the grain or the thickness required of the paper. I think that the paper was whatever I got from Walmart. It ended up not being as opaque as I would’ve liked and the pages bled through the paper. It wasn’t a huge problem reading it, but it is noticeable. Worse was that I bound against the grain of the paper. The result that the pages buckled a little and, instead of opening nice and smooth, they were stiff. 2. The paper on the dust jacket was also too thin. 3. I got a little messy with the glue on the cloth binding. 4. I learned that when my only tools for cutting are a razor blade and a ruler, my pages tend to turn out a little uneven. 5. I used only PVC glue on the binding and I wonder if the binding is stiff as a result. As a whole, I was pretty pleased, though. And I was off on a bookbinding extravaganza! So it’s been almost a year. Ah well. I’ve got a whole bunch of projects to post about and, now that I’ve got the ol’ blog redesigned, I’ll be posting some new stuff. So, look for some fun in the near future! The other day, I was noticing that I had been spending most of my painting time on sketches. It had actually been a while since I had really laid down some layers on a painting. So, to remedy that, I quickly sketched out Lord Ironbottom here. I really like the textures that one can get with lots of layers, not to mention the vibrancy. I also like how the warms and cools play off each other. At the same time, he rather looks to be a stern kind of fellow and I suspect he’s well out of fighting age. All the same, the monocle is a nice touch! I hope that every one is going to have a wonderful Thanksgiving!! 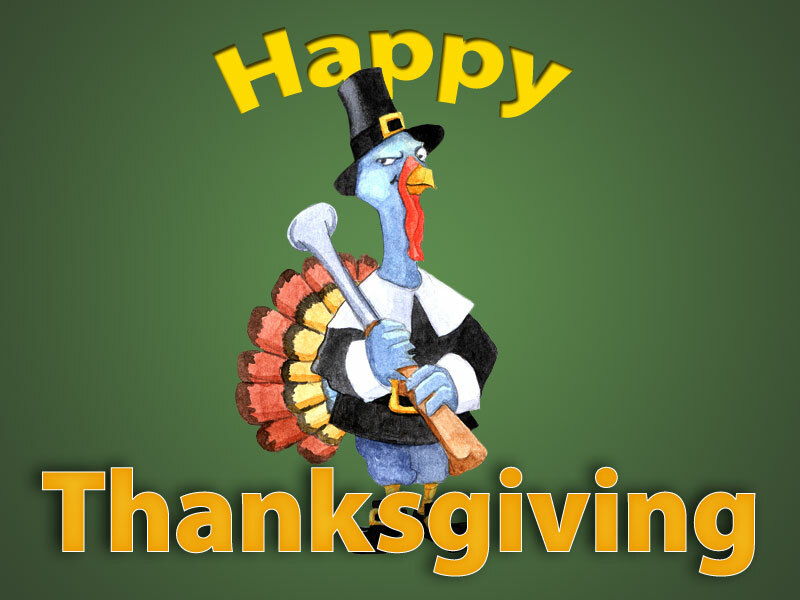 May it have lots of Turkey and Mashed Potatoes! 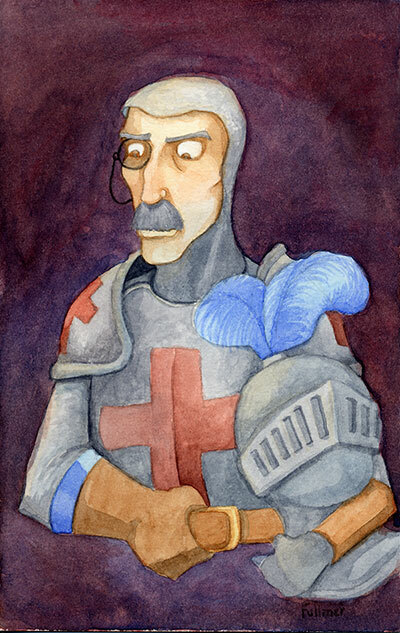 To get myself in the mood for Turkey Day, I painted this suspicious looking guy. 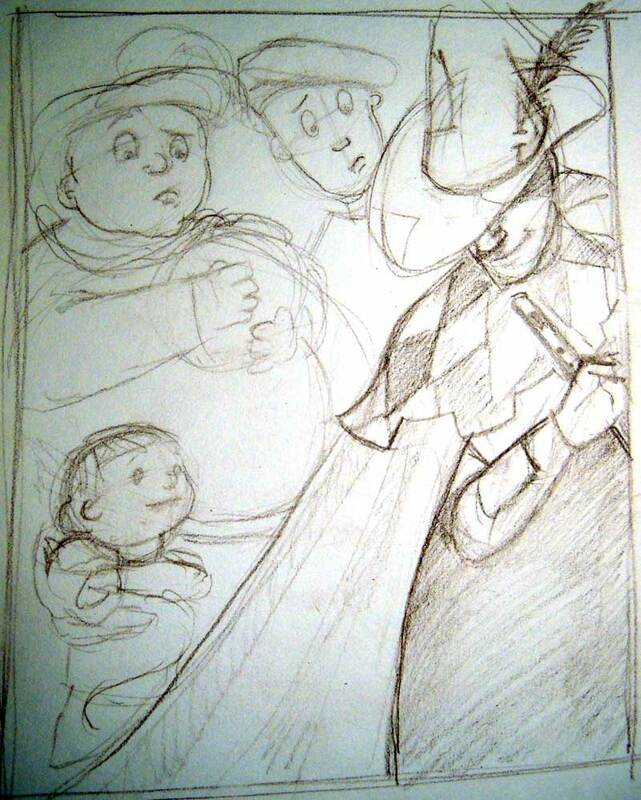 After I finished it, I realized that I probably got the idea from Peter DeSeve or someone like that. Hopefully they won’t mind. 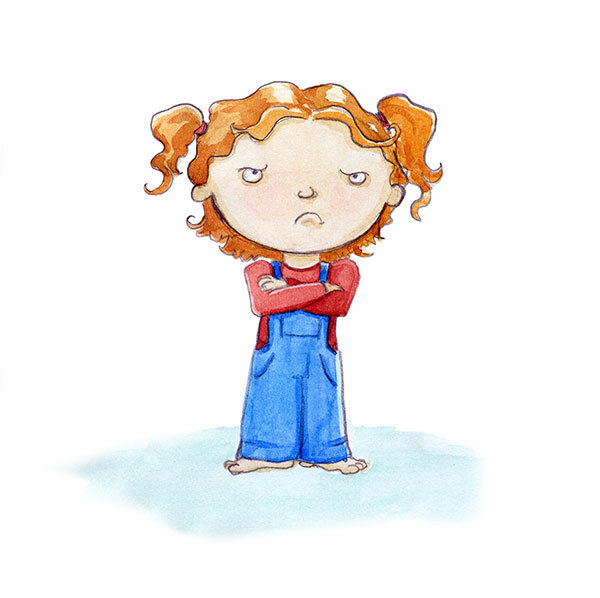 My youngest daughter has gotten into throwing temper tantrums. During one of these, I found it quite helpful to just sit down and paint. 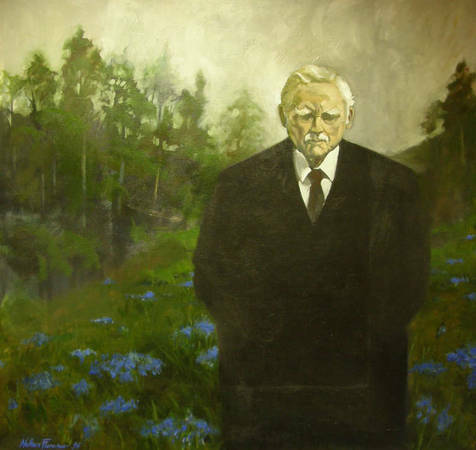 No surprise that my painting brought out a portrait of my grumpy little girl. 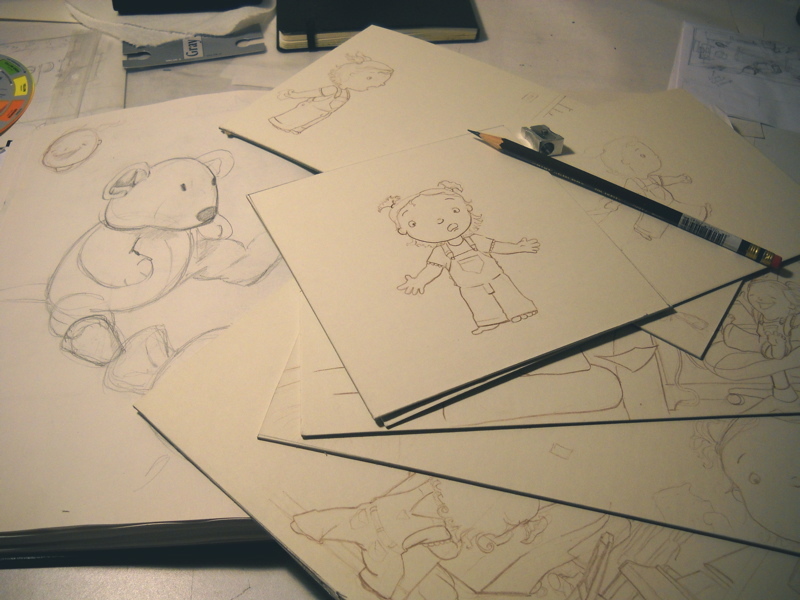 On the portfolio front, I’ve gotten down to the last four weeks before I need to have these four pieces done. It means I really have to cram. I’m still undecided as to what I’m going to do about the Beauty and the Beast piece. I’m not completely satisfied with it. So, I made up three more thumbnails (yes, I need to press harder with my pencil if I plan on scanning these). I’m still not completely satisfied. I like the composition of the one on the right, but it doesn’t tell much of a story. So, I’m putting it on the back burner to enable me to get to the other ones. Here are the next two pieces that I’m going to do for the portfolio. This first one is just a general fantasy piece (not tied in with any specific story). I’m currently referring to it as the gryphon piece. 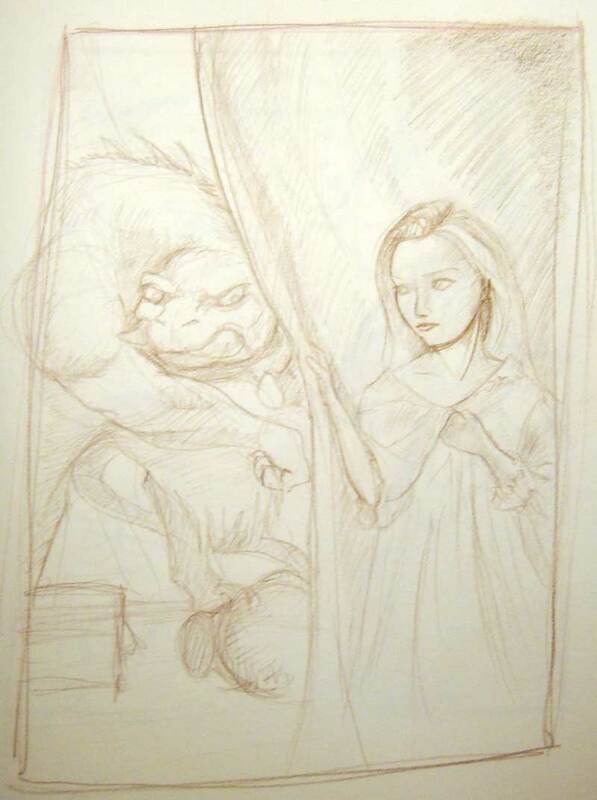 I had originally wanted to put the gryphon as the focus of the piece and have the girl facing-off with the monster. But, thanks to some suggestions (thanks Jay!) I turned the layout around 18o degrees and took the view from just below the gryphon. This layout works better for me. Though it does put the subject directly in the center of the composition, I like how the gryphon frames her. 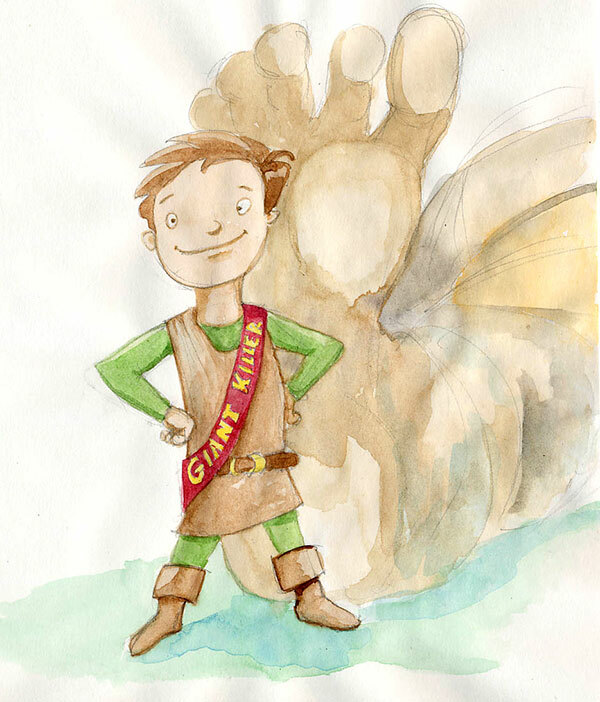 The final piece is going to be for Jack the Giant Killer. Several months ago, my girls and I were reading fairy tales and opted to read Jack the Giant Killer. Well, the version we chose was long and not very interesting. As a result, we decided to re-work the story. I sketched out some fun stuff and ended up with a story that I hope to continue to work through. But for the moment, here’s just one scene. Jack is triumphant after capturing one giant with nothing but some cheese on a stick! In the finished piece, I hope to push the pose that Jack has a bit more to make him more proud. Something along the lines of this watercolor sketch that I did when I was first playing around with the story. In seven weeks, I’m going to the Fall retreat for the Society of Children’s Book Writers and Illustrators here in Wisconsin. It’s my first time going and Im’ awfully curious. The problem is that I’ve signed up for a portfolio review and I don’t actually have a portfolio. I’ve got 2 completely full sketchbooks from the last couple of years, but that’s hardly something that I want to show an art director. So, it’s crunch time. I’m going to work my tail off for the next few weeks and try to get several things ready to show off for the retreat. In seven weeks, I hope to have four pieces to show off and a finished copy of Where’s Mousy (see last post). The first step is to learn how to digitize pencil drawings. Until I get that worked out, you’ll have to put up with cruddy images that have been scanned or photographed under low lighting. My scanner leaves a lot to be desired. 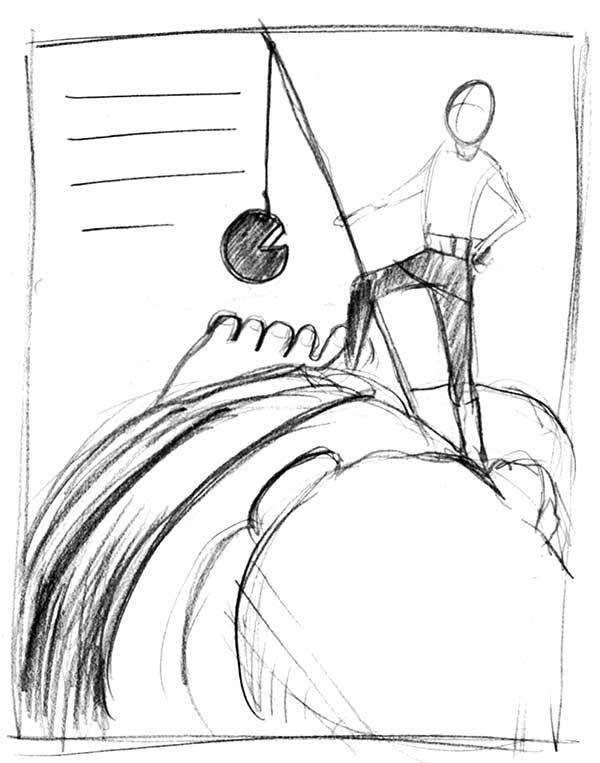 The second step, though, is some thumbnails. 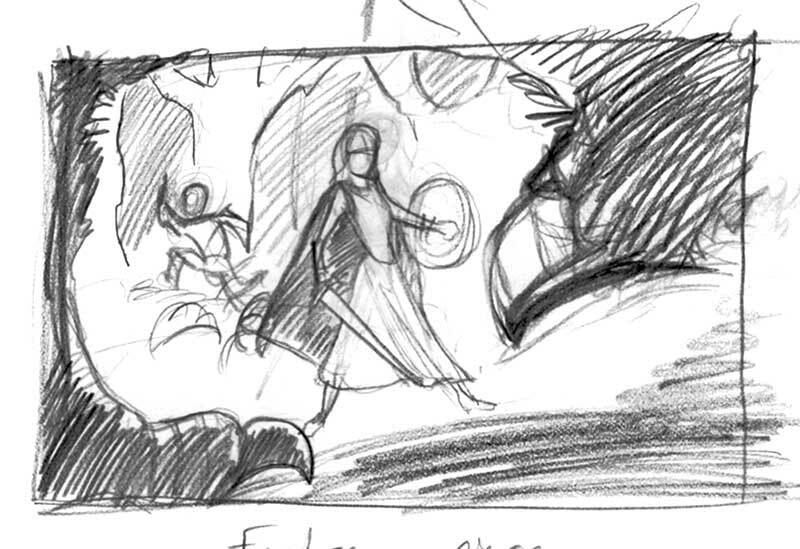 I’ve already done basic thumbnails for all four pieces. I’m going to have one piece on the story Beauty and the Beast, one for the Pied Piper of Hamlin, one for Jack the Giant Killer, and one that isn’t related to any story. On my first go at Beauty and the Beast, I wanted a piece that showed the difference between the two main characters and gave a bit of an ominous tone to the whole thing. I decided to go with a shot of Beauty pulling back a curtain to peak at the beast. She’d be a bit disheveled in a night dress or something of the sort. Behind the curtain, I wanted to show the beast. Initially I came up with this idea. I liked the pose for Beauty, but I didn’t like the beast at all. 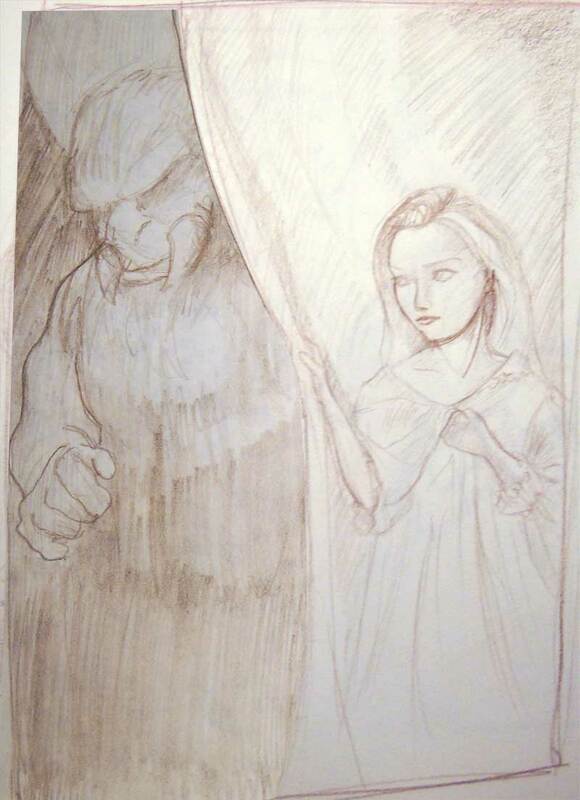 In the second version, I brought the beast much closer to the curtain, making the scene a bit more intimate and brought some darkness in around him adding to the sense of danger. I think it sits much better and I like the overall feel of this one. My daughter things that the beast looks like Chewbacca (I kind of agree), but I hope that he’ll come off less hairy in the final piece. For the Pied Piper, I wanted to do a scene that showed the Piper right after being denied his payment by the Mayor of Hamlin. I wanted to show the Piper walking away with a dark smile on his face and give the Mayor and his cohorts worried expressions as though this isn’t quite how they expected this to play out. When I was done with it, it seemed like it needed a little something in the lower left-hand corner of the piece, so I added a boy, smiling at the piper to hint at what is to come. When I originally thought this scene out, I wanted the piper to have a cat – it seemed just natural. But, it didn’t work into this shot, so I had to give the cat to the boy. I hope he cares for it well (now that there aren’t rats for it to eat).